Hey Grommet Nation! This Is Ground creates handmade leather goods that started as creative solutions to everyday problems. Our first products, the Cord Taco and the Cordito, gained attention and love because of their simple design and utility... and because everyone loves Mexican food. All of our products are 100% designed and made in Los Angeles, USA -- and our die maker has made dies for 50 years here in L.A., and about the same story with the cutters, engravers, etc. who we work with. A lot of heart and grit goes into our creations. We hope you like them! 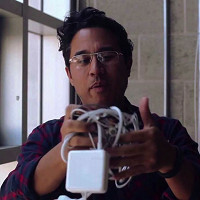 Hi Mike, This site shows you holding a square laptop plug. However, rolled up, the Wrap doesn't show the larger square plug in it. Does it fit? @Cindy Thanks for checking it out! The large laptop plug (the MacBook charger) has a solution as well that we just created, called the Cordlupa. I will see if we can get it listed here on The Grommet. But the Cordito / Cord Tacos do not fit the large plug. Sorry for the confusion! Holy Cow, Batman! Is this a rip-off or what (literally)! $40 for a piece of skin with some slits in it (ie. no sewn parts) that really don't hold enough items? The only thing worse is $35 for a couple (3) of micro-sized pouches (that don't hold enough) to add to it! By far, the Cocoon GRID-IT! is a superior offering and at $15 a fair bargain. In fact, I would be more than willing to pay $40or so for the GRID-IT! in leather like the Cordito Cord Wrap. I would then have something stylish AND useful. Jeez. Only in La-La Land. Thanks for your feedback - we always welcome differing opinions and we know that not every Grommet will fit everyone's tastes or budget. We know our community well - they are a diverse group and need diverse offerings. Some people do enjoy "the finer things in life" as Aaron says in the video and happily support this entrepreneur who handcrafts these genuine leather pieces right in Los Angeles. Those members of our community who are strong supporters of made in the U.S. products may gladly support this project - if not by purchasing, but by sharing and applauding. Instead of looking to the future to solve the cord chaos caused by today's electronics, Mike Macadaan, the founder of a company called This is Ground has turned to the old world charm of leather to bring new order to our devices. A designer by trade and a tinkerer by nature, Mike’s philosophy is simple—to create useful American Made products with a warm and authentic sense of style. With this idea in mind, he searched countless factories and manufacturers near his home in Los Angeles, CA until he found what he was looking for in the hands of a die cutter with nearly 50 years of experience. Together, with the help of two other skilled crafters, Mike and his team continually come up with new solutions to everyday problems using the ancient craft of leather. 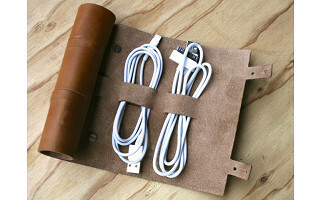 The Cordito Cord Wrap lets you neatly roll and stow up to 3 cables and 2 plugs into a burrito-like case. 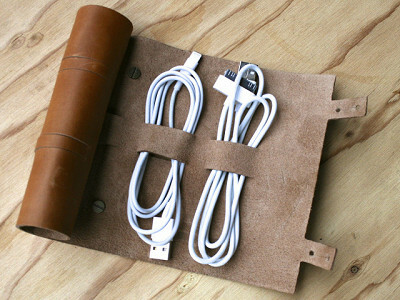 Great for USB cords, earbuds, and chargers. The Cord Taco is a one-cord wonder for headphones and other small wires. Simply coil the cord, place it in the taco, and pinch to close. The Knick Knack Nacho is a clever folded pocket for holding small, easy to misplace USB storage drives, memory cards, even everyday items like jewelry and coins.